Medicinal nucleic acids like antisense oligonucleotides, antagomirs, gene vectors, mRNA, or siRNA are exciting novel drugs for manipulating gene expression in a controlled, therapeutically useful way. Because of their physicochemical nature, medicinal nucleic acids cannot freely diffuse to the intracellular target sites to exert their therapeutic function. Polymers have been developed as carriers, which package nucleic acids and protect them against degradation. These carriers specifically attach their nucleic acid cargo to cells via targeting ligands and trigger intracellular uptake. They participate in intracellular delivery steps including endosomal escape. Depending on the intracellular site of action, they may play an important role in cytosolic migration, nuclear import, and subsequent presentation of the nucleic acid in active form. 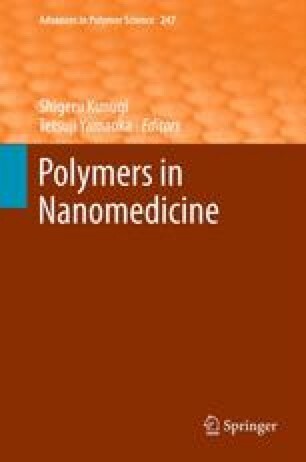 Ideally, polymers act in a bioresponsive way to overcome the different delivery steps. Therapeutic developments with medicinal nucleic acid polyplexes, including recent clinical trials, are discussed. Many thanks to Olga Brück (LMU) for skillful assistance in preparing the review. Our own work in the reviewed research area was supported by the German DFG excellence cluster “Nanosystems Initiative Munich (NIM)” and the BMBF Munich Biotech cluster m4 project T12.